The singers are in town and rehearsals are now underway for Lucia di Lammermoor. 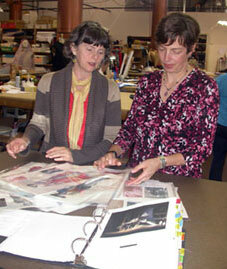 But the production of an opera doesn't begin with the arrival of the singers — just ask Costume Designer Deborah Trout (pictured left, with Costume Shop Manager Susan Davis), who began thinking about designs for Lucia a year ago. Now, with just over three weeks until opening night, Trout and the hard-working staff of Seattle Opera's Costume Shop are busy making sure each dress and suit looks its best by October 16. We were recently able to catch Trout in a spare moment and ask the Seattle native about her design process, and the concept behind these Lucia costumes. When you design costumes, what sources do you go to for inspiration? What inspired you specifically for these costumes? The music is always a starting place. For me, it's a kind of emotional response to the music. I am not a musician and I don't know how the construction of music works but I understand the intellectual, emotional, and visceral response to music. So I really start there, and that frequently takes me into either colors or textures. Since we knew what our silhouette was because of the period [mid-nineteenth century], I was able to fill in with color and texture. I looked at a lot of paintings and photographs from the period, and there was a lot of royalty that had great portrait paintings. I looked at a lot of that so I could feel the characters. 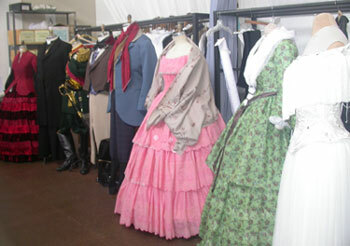 A selection of the costumes from Lucia, including a version of Lucia's wedding dress (right). Seeing your sketches for Lucia and now seeing the actual costumes coming to life, it's easy to appreciate the women’s beautiful dresses. But the men's outfits have gorgeous lines. Do you prefer designing for men or for women, or do you enjoy both equally? They are equal. But it's funny because when I go talk with [men's tailor] Mary Ellen Walter, I fall in love with the men and it's like, "Oh my gosh, let's make their legs do this and let's bring their chest out this way!" I like playing with the manliness of it. And then when I go to work with [women's draper] Mark Sanchez, it's a completely different love affair and I think, "Ah, women are the thing, the costumes are so beautiful." I fall in love with both. In most productions of Lucia, the audience sees Lucia in her wedding gown while she signs the wedding contract at the end of Act 2, and then sees the gown bloodied in Act 3 after she's gone mad. But in this production, you've deliberately chosen a different outfit for Lucia to wear when she signs the contract. Can you explain what we'll be seeing? Well, what we have going on is that in Act 2, Scene 1, Lucia's brother has demanded that she come down and sign the contract and says to her, "You know, Edgardo is not standing by you, have you heard from him?" It's as if she's being forced out of her bedroom to come down, so she's in a little blouse that will feel vulnerable and not put-together. She's wearing a red velvet period skirt, and a vulnerable white blouse. And that's earlier in that day and they see that she's not appropriately dressed to receive guests. In the next scene with Arturo's arrival, she's sort of put herself together with a red suit that includes the skirt we saw in the scene before. Now it's Act 2, Scene 2, and she's ready to receive and sign the contract. I want that dress to feel like she's trying to put on armor, like she's trying to protect herself. It is heavy velvet, and has a bodice that buttons all the way up to her neck. It's like she’s trying to hang on for dear life. Then the wedding happens off stage, and in Act 3, Lucia and Arturo have been upstairs in the bedroom and she's murdered him, and comes downstairs in her bloody wedding dress. She's struggling with it and removes layers of that, becoming vulnerable again to all the party guests. And then she dies [laughs]. The red velvet dress Lucia wears while signing the wedding contract. You’ve worked with Seattle Opera before [Le nozze di Figaro, 2009], but most of your past work has been with theater companies. 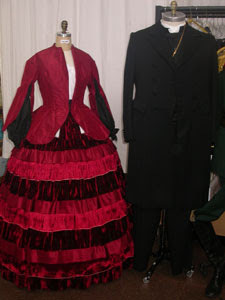 Do you find there are any challenges in designing costumes specifically for an opera? In terms of design, not really. But it's a little different in terms of organization and remembering certain things that singers prefer compared to actors, like how tight a collar is. And the stamina of chorus fitting after chorus fitting is different from theater. My other large-scale stuff tends to be Shakespeare, and even that doesn’t deal with the masses of chorus. I also find that in my theater life I'm a bit more organic in my relationship with the actors and their costumes. There's a lot more conversation in a fitting about their costume evolving. Here, just by of the mass scale of it, by the time we go into a fitting, there are so many decisions that have already been made. The pressure to have made it right even before the singer arrives is a little higher. for some very interesting insights and explanations (incl. Lucia's costumes in Acts II and III and the differences in working with singers and with actors/actresses!! Toi, toi, toi for your costumes for the "Lucia"! production; I wish I could see yours "live"!! Instead, I'll be seeing costumes for the new production here in Schwerin, Germany, in November.